Trader Joe’s is coming to Austin, the Statesman.com reports. The California-based chain, famous for its “2 Buck Chuck”, $2 store brand bottles of wine, will be downtown on the site of the former Seaholm Power Plant. A mixed-use project which will have 298 apartments, 130,000 square feet of office space, 40,000 square feet of retail space and an acre of event space outdoors, is slated to start construction in July. The Trader Joe’s store will have a much smaller footprint at only 11,500 square feet, and will open sometime in 2013. 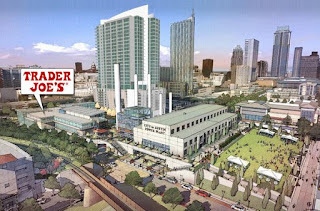 Over 4,000 people signed an online petition asking Trader Joe’s to come to Austin, and the Austin location is the eighth announced in Texas. The chain has 365 stores in 32 states and is famous for its discount prices and barebones stores. Trader Joe’s target consumer is “an urban high-income resident”, attracted by the chain’s house brands and wine specials. 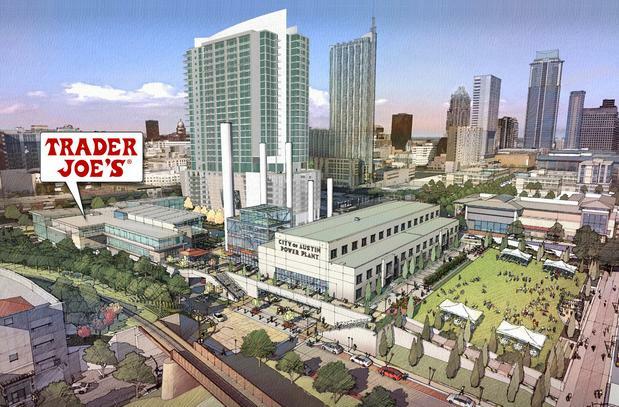 With the explosion of downtown apartment and condo dwellers Austin has seen in the last few years, Trader Joe’s should have no problem finding customers who fit that bill. Trader Joe’s competitors will be locally based Whole Foods and HEB’s Central Market, although market analysts don’t think the store will have much impact on either of those company’s bottom lines.